On 30 September 2018 in Indonesia, residents evacuate victims who died during the Palu earthquake at the Balaroa National Park, West Palu, Central Sulawesi, after the earthquake and tsunami that struck Sulawesi on September 28. 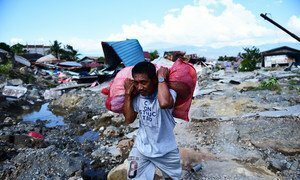 “The Government of Indonesia have confirmed that 1,234 people have died following the earthquake and tsunami in Sulawesi,” Jens Laerke, from the UN humanitarian coordinating office, OCHA, told journalists in Geneva. At a collapsed church in Sigi Biromaru district, to the south of Palu city, rescuers described struggling through thick mud to retrieve the bodies of more than 30 youngsters from a bible study group. “It took them one-and-a-half hours to carry each of the bodies out to nearby ambulances, having to wade through incredibly deep mud,” said Matthew Cochrane, spokesperson for the International Federation of Red Cross and Red Crescent Societies (IFRC). People survey damaged buildings in West Palu, Central Sulawesi, after the earthquake and tsunami that struck Sulawesi on 28 September 2018. UN agencies and partners have already responded to Government calls for assistance, but access is still difficult to coastal and central areas of Sulawesi, where the full scale of the damage is unknown. As part of the international response, the World Food Programme confirmed that it has been in close contact with the authorities since last Friday, when the disaster happened. WFP’s humanitarian warehouse in Subang, Malaysia, is also on “standby” to release emergency supplies, spokesperson Herve Verhoosel said. The potential impact on youngsters is particularly concerning, UN Children’s Fund UNICEF said, with more than 40 per cent of under-fives in Central Sulawesi already stunted from malnutrition. The fact that only 33 per cent of births are registered in the area is also a potential obstacle to reuniting unaccompanied minors with their families, UNICEF spokesperson Christophe Boulierac said. “In Central Sulawesi we have concerns not only for the safety of children in Palu, but also in the city of Dongala and other communities still cut off from humanitarian aid,” he said, adding that the full impact of the earthquake and tsunami disaster was not yet clear. Immediate priorities for the Government include evacuating people away from the worst-hit areas, according to the UN migration agency, IOM, but transport remains difficult and roads “perilous”, spokesperson Paul Dillon said. Earlier on Tuesday, IOM’s Chief of Mission in Indonesia, Mark Getchell, had discussed the situation with the authorities, Mr Dillon added. Aid could be delivered via a “humanitarian land bridge” from Jakarta to Sulawesi, Mr Dillon said, noting that the idea had been implemented following the 2004 Indian Ocean tsunami, from Jakarta to Aceh and from Medan to Aceh. Delivering aid to Sulawesi through the port of Palu, continues to be a major challenge, however, the IOM spokesperson explained. Although the priority is on reaching survivors, damage to basic infrastructure and lack of clean water also pose a significant health threat. Even before the disaster, Dongala and Palu had registered cases of acute diarrheal diseases and acute respiratory infections, said Tarik Jasarevic, spokesperson for the World Health Organization (WHO). The WHO official noted that an initial assessment by Indonesian officials had indicated that one hospital had suffered damage, while other health centres are being assessed. In coordination with the Ministry of Health’s Crisis Center, the UN agency is also preparing to offer to deploy registered medical teams, Mr Jasarevic added. On 29 September 2018 in Indonesia, a number of cars are piled up after being dragged into the sea by the impact of the Tsunami on Talise Beach, Palu, after the earthquake and tsunami that struck Sulawesi on September 28. UN Resident Coordinator in Indonesia, Anita Nirody, said in a press statement that the response to the earthquake and tsunami was being coordinated by government and national disaster management board, and regional disaster management agency (BPBD), under the overall leadership of the Coordinating Minister for Political and Security Affairs. “With so many people having lost all their possessions and with many basic services down, there is also an urgent and immediate need for food, clean water, shelter, medical care and psychosocial support,” said Ms. Nirody. Rescue workers are still trying to reach areas of Sulawesi in Indonesia affected by an earthquake and tsunami, UN humanitarians said on Monday, noting that more than 840 people have died and more than 600 have been severely injured in the disaster. Following a major, 7.5 magnitude earthquake in Indonesia’s Central Sulawesi province on Friday, the United Nations Secretary General António Guterres said in a statement that he’s “deeply saddened” by the “terrible loss of life” and injuries from the disaster.